These Apple Rolls are perfect for a quick breakfast or brunch in the fall. Or anytime for that matter! They are quick, easy and delicious! Peel and finely chop the apples. In a medium bowl stir together the diced apples with the walnuts and brown sugar. Divide the apple mixture evenly into the muffin tin. Put cinnamon buns, cinnamon side down, on top of the apple mixture. Put the muffin tin on a baking sheet and bake until the tops are golden brown, about 8 to 10 minutes. Remove the muffin tin from the oven and allow to cool for 5 minutes. Put a clean baking sheet on top of the muffin tin and flip to remove the sticky buns. In a small bowl, combine 2 containers of the vanilla frosting with the cinnamon 1 to 2 teaspoons of milk. Mix until very thick and of pourable consistency. Drizzle over buns and serve. I am always looking for great ways to use all of those leftover meats that hang out in the fridge after the holidays. Here is a great, quick and easy breakfast! In a small pan add a little butter and sauté the ham dices on medium low until slightly browned. While ham browns whisk together the eggs, milk, salt & pepper. When ham is browned add the egg mixture and let it set for a few seconds. Slowly fold the eggs until they reach your desired consistency. Sprinkle cheese and give one last fold. 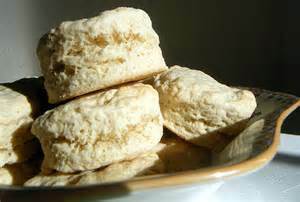 Often times scones can be dry and crumbly. Not these!! These are the best scones you’ll ever have. Great served with a real cup of British tea! Adjust oven rack to lower-middle position and preheat oven to 400 degrees. In a medium bowl, mix flour, 1/3 cup sugar, baking powder, baking soda and salt. Grate butter into flour mixture on the large holes of a box grater; use your fingers to work in butter (mixture should resemble coarse meal), then stir in raisins. In a small bowl, whisk sour cream and egg until smooth. These muffins were the result of a strawberry picking trip the kids and I did last year! They are so, so, so GOOD! Put the rack in the center of the oven and preheat to 400°F. Line a 12 -18 muffin tin with paper or foil baking cups. In a large mixing bowl, combine the flour, sugar, baking powder, cinnamon, baking soda, and salt and whisk to blend. In a medium bowl, whisk together the sour cream, melted butter, eggs, and vanilla until smooth. Lightly stir the sour cream mixture into the dry ingredients with a spatula until the batter just comes together; do not overmix. Gently stir in the strawberries. The batter will be thick. Divide the batter among the muffin cups, using the back of a spoon or a small spatula to settle the batter into the cups. The batter should mound a bit higher than the tops of the cups. For the topping: In a small bowl, combine the sugar and cinnamon and mix well. Sprinkle a generous 1/2 tsp. of the cinnamon-sugar mixture over each muffin. Bake the muffins until they’re golden brown, spring back most of the way when gently pressed, and a pick inserted in the center comes out clean, 18 to 22 minutes. Transfer to a rack and let the muffins cool in the pan for 5 to 10 minutes. This coffee cake has been in my arsenal for a LONG time!! I was making this before I had children. It is still a favorite today. My kids often ask for it as a Saturday breakfast treat. It’s moist and flavorful. There is never much left! Cream together butter and sugar. Add eggs and vanilla. Combine dry ingredients in a separate bowl. While mixer is running add flour and milk alternately. Mix until just combined. Spread into a 9×13 pan. Melt butter, add to brown sugar and cinnamon. Pour over the surface of the batter. With a knife swirl in the cinnamon mixture until evenly distributed throughout the batter. Bake uncovered at 350 for 35-45 minutes. Until lightly golden and set. These Apple Rolls are perfect for a breakfast or brunch. It’s ok to take a little help from the store! They are quick, easy and delicious!